The first computer marketed by CBM. It had been developed by MOS Technologies prior to MOS' acquisition by CBM (1977). It was basically a bare-bones 6502 "trainer". 1K RAM, 2K ROM. 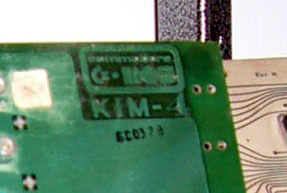 With the optional KIM3B memory board & KIM4 motherboard were expandable up to 65K. Know anything more about the KIM-4? Please contact us. Know anything special about Commodore or the KIM-4? Contact us!